Quiet location. No crowd under your windows, but you need a car. Clean and comfort rooms. Good beach close to the hotel. 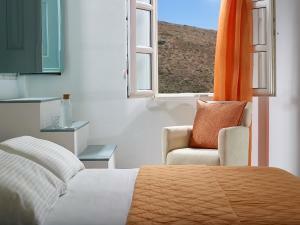 Large room and bathroom with kitchen and cooking facilities. Managing helping us for organisation of Ferries and other reservations. Large, clean a quiet room with a nice sea view. The description and pictures correspond exactly to the reality. The rooms was kept squeeky clean every day. Breakfast was always slightly different every morning so you never got bored of it and sometimes we were treated with the local cheese from the family dairy on site. A lovely touch. Erika, her family and staff were very welcoming and on hand for tips and organising trips. We didn't hire a car or quad bike, we took the local buses instead. They stopped right outside and we were able to get to all the beaches and attractions of Milos. The beaches on either side of Asterias boutique were beautiful and only a short stroll. Nice view of the sea from the Hotel room. The hotel is very basic, but it's clean and I felt very comfortable; definitely a great value if you're on a budget. The staff were very friendly. When we arrived, we were given a map of Milos and shown where the best beaches and tavernas on the island were. This map turned out to be the only guide to island we needed and was the perfect amount of places to see and for the time we were there. It really made our holiday to the point where we referred to it as the 'Erika map'. Thank you Erika! Staff, super friendly and helpful. 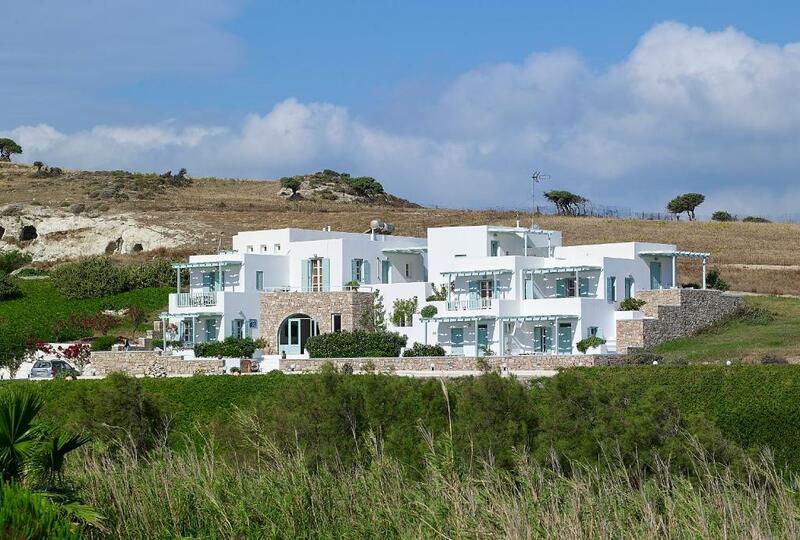 Location close to the beach (not the nicest beach in Milos though). Breakfast was simple but great (we had only once because the morning sun was too warm at our balcony). Calmness of the area. Super clean, cleaned daily. 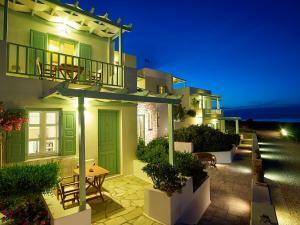 Lock in a great price for Asterias Boutique Hotel - rated 9 by recent guests. 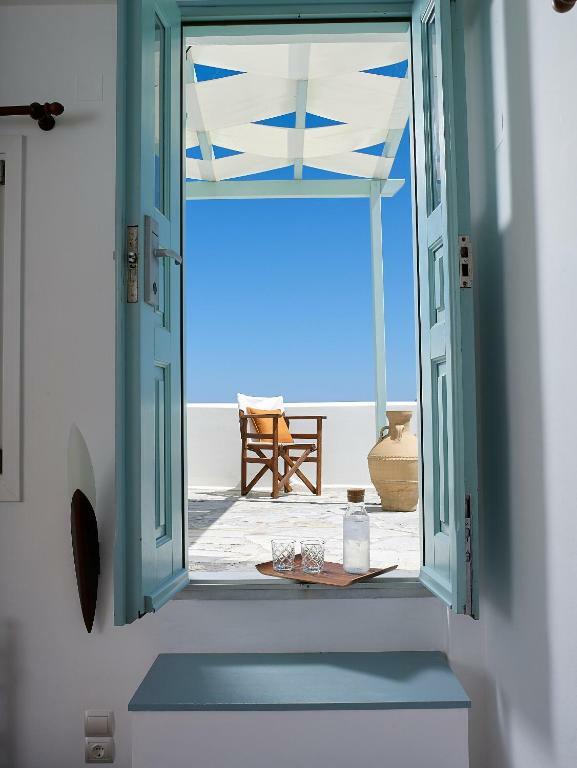 Located 200 yards away from Pachaina Beach, Asterias Boutique Hotel is a Cycladic-style complex offering self-catering, air-conditioned accommodation with sea or mountain views and free WiFi access. It includes a bar. Following the local style, Asterias Boutique Hotel features iron beds and green or orange details. They include a dining area, a well-equipped kitchenette and a flat-screen, cable TV. In the bathroom, guests will find free toiletries, bathrobes and slippers. Breakfast can be served in the units on request and at extra charge. Asterias bar serves drinks, fresh juices and coffees which guests can enjoy in the lounge area featuring a flat-screen TV. The seaside village of Pollonia with its fish taverns and seaside cafes is 0.9 miles away. 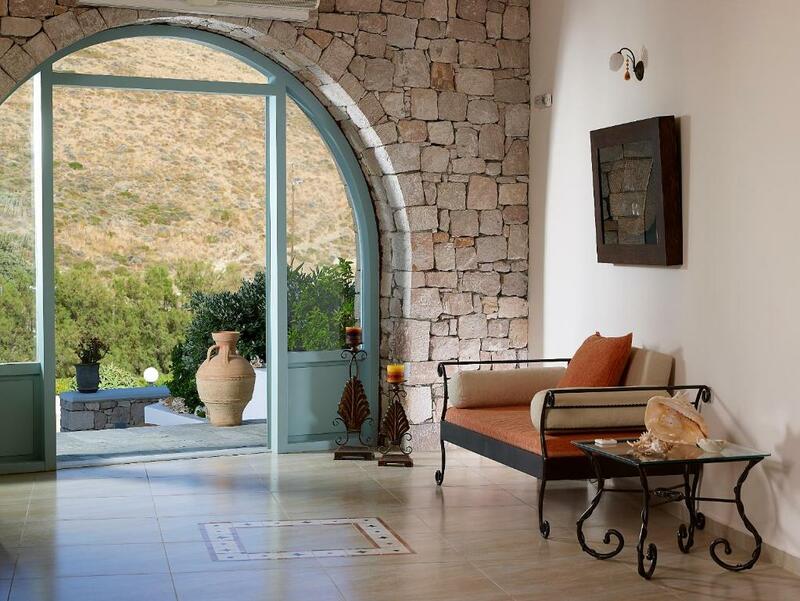 Adamas, the port of Milos, is at 7 k, while Milos Airport is 5.6 miles away. Within 50 metres, you can find a bus stop and free private parking is provided on site. 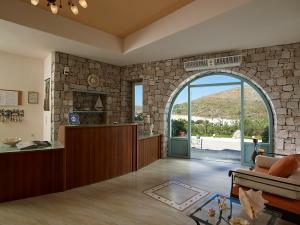 Asterias Boutique Hotel has been welcoming Booking.com guests since 2 Aug 2012. When would you like to stay at Asterias Boutique Hotel? Laptops are available upon request. No extra bed can be accommodated. 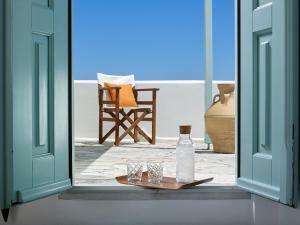 House rules Asterias Boutique Hotel takes special requests - add in the next step! Asterias Boutique Hotel accepts these cards and reserves the right to temporarily hold an amount prior to arrival. Please note that for group reservations of 3 rooms and more, different policies and additional supplements apply. WIFI sometimes was very poor. The prepayment was not exactly what we expected regarding the breakfast prepayment. After discussion with the manager, a compromise was found. A bit far from everything, need a car. The beach close to the hotel is not very welcoming. Weird cleaning smell. Ventilation in the toilet works with a motion sensor and is a bit loud. Refrigerator in the kitchen was very loud. Location, while I did love the fact the area was very calm, the distance to shops and restaurants makes a vehicle mandatory (staff will help you with that). The staff (family!) was so friendly, welcoming and helpful in planning our three days on the island. The view driving to, and at the property is wonderful. There is a great beach to watch the sunset a few min walk down the hill. The simple breakfast is fantastic and a great way to start the day. the refrigerator would make a loud noise at night when it would turn on, which would occasionally wake us up- however- we loved this hotel so much it didn't bother us one bit, because everything else was perfect. Very quiet- no pool and outside bar with loud tourists- very clean- very friendly staff. This is a hotel for people that like peace and quiet. It feels more like a personal private apartment than a tourist trap hotel. You enjoy your self around the island during the day and evening- then you come back to your quiet room. Very close to beach- nice star gazing at night- its perfect. 10 out of 10 no doubt. That's the hotel I will return to. The hotel is new and very clean. A private beach is nearby. The owners are lovely. The bathroom is really nice, too.